Yogurt can be a staple in a healthy diet, providing you with a good source of calcium, protein, vitamin D and potassium. Picking any yogurt brand or eating yogurt in excess, however, can contribute to problems such as weight gain, high cholesterol and heart disease. The many yogurt brands in your supermarket fall across the nutrition spectrum, from heart-healthy to fatty, sugar-filled products little better for you than candy. Read yogurt labels carefully to choose the healthiest type. Some brands load their yogurt with sugar. Yogurt naturally contains about 11 grams of sugar per 1-cup serving, but many of the flavored varieties in the grocery store contain twice that amount. Often fruit-flavored yogurt is enhanced not with actual fruit but sugar-laden syrups or concentrates. Not only do these pack on extra calories, but a diet high in sugar also can increase your triglyceride levels. Check labels to be sure, but generally, "light" varieties of yogurt use artificial sweeteners and will have a lower sugar content. 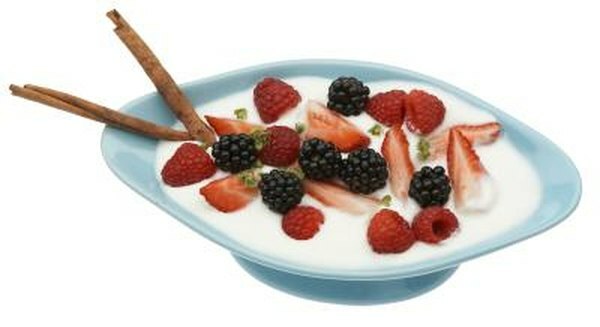 Better yet, you can buy plain yogurt and sweeten it yourself with fresh fruit or a small amount of honey or table sugar. Saturated fat raises your low-density lipoprotein or "bad" cholesterol levels, puts you at a higher risk of heart disease and might put you at a higher risk of Type 2 diabetes -- and your yogurt might be swimming with it. Even if you eat plain yogurt, it could contain about 5 grams of saturated fat per 1-cup serving if it's made from whole milk. Yogurt made from skim milk contains virtually no saturated fat and has all of the same nutrients as whole milk yogurt. Low-fat yogurt varieties fall somewhere between the two extremes, so always check for saturated fat content when choosing your yogurt. A disadvantage of any food with a reputation for being healthy is that you may use it as an excuse to overindulge, particularly in the case of convenient snacks like sweetened yogurt. While even the less healthy varieties of yogurt make for a nutritionally better snack than ice cream or baked goods like doughnuts, you'll cancel that out if you eat several cups of yogurt a day. The U.S. Department of Agriculture recommends limiting your overall dairy servings to 3 cups per day. That includes not just yogurt but any milk, cheese or other dairy products. One of yogurt's oft-touted health benefits is that it contains good bacteria to help both your digestive and immune systems. While this is generally true, it's not the case for all yogurts, and you can miss out on this health benefit if you don't read labels carefully. Although all yogurt contains live bacteria cultures at some point, treating yogurt with heat kills them. This is the case particularly with frozen yogurt treats. Always look for the National Yogurt Association's Live & Active Cultures seal when you buy yogurt, and pass up the brand if that seal is missing. Oklahoma State University: What Is Yogurt?